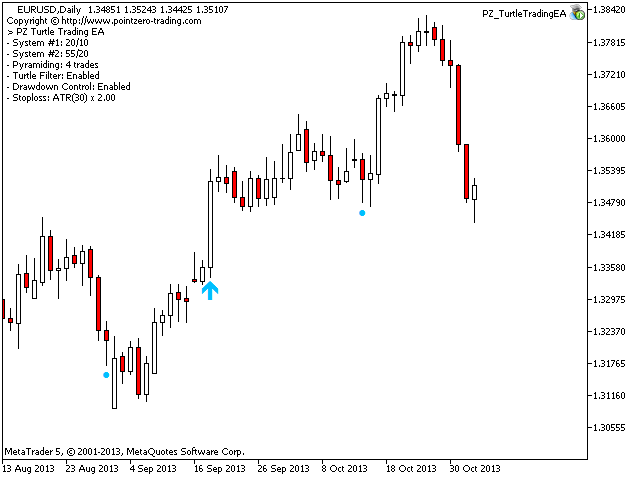 This expert advisor implements the original Dennis and Eckhardt trading system, commonly known as The Turtle Trader. It trades exactly like the original turtles did, and can be used by experienced traders to capture trends in up or down markets. This EA implements the default settings of the original turtle traders, but much has changed in financial markets since then. In order to achieve profitability, the trader will have to apply its best judgement about what to trade and optimize the settings in the strategy tester. When loading the expert advisor to any chart, you will be presented with a set of options as input parameters. Don't despair if you think they are too many, because parameters are grouped into self-explanatory blocks. This is what each block of parameters does. 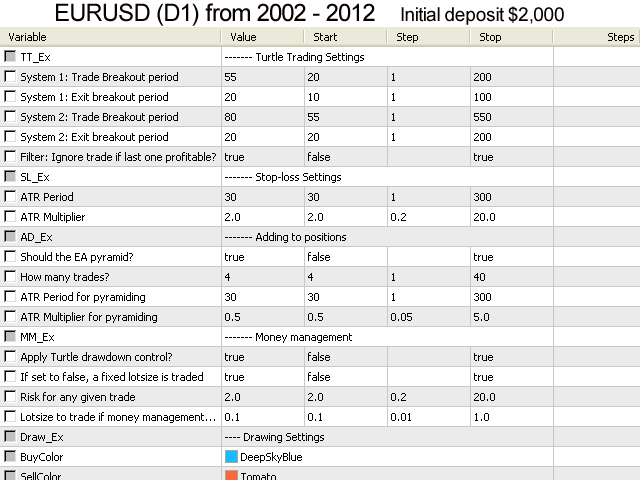 This group of parameters allows you to customize the period of trading systems S1 and S2 and use of the filters. Once a trade was taken, the original turtles would pile up three more positions on top on the first one, by adding an additional trade every time the market moved in their favor 50% of the ATR. This group of parameters allows you to disable or customise this behavior. 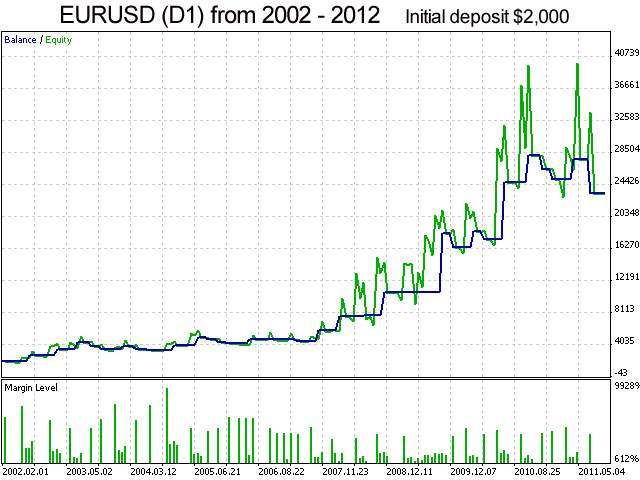 The initial stop-loss for all trades is, by default, two times the Average True Range. You can set your own stop-loss using this group of parameters. 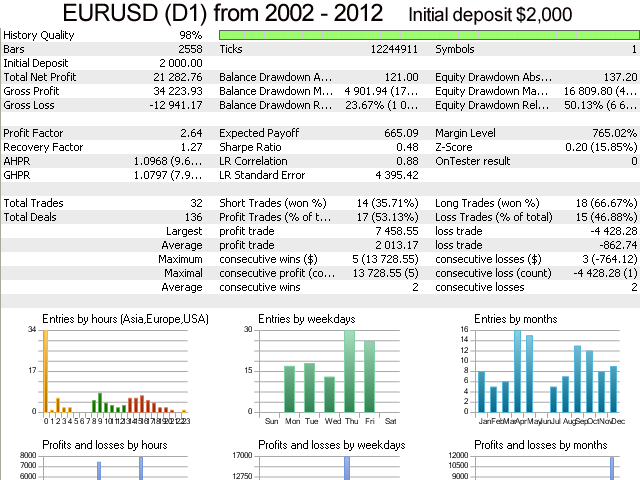 For every 10 percent in drawdown in their account, the turtles cut their trading unit risk by 20 percent. In this group of parameters you can disable this behavior, and customize the common money management parameters.